Uganda is a low-income country, among the poorest, with proportionally the highest population of children under the age of 16 years in the whole world. Children have a right to education and, in this context, ensuring vulnerable children have access to education is critical. In 1997, the government instituted Universal Primary Education (UPE), a national policy to provide free primary education for underprivileged children. While the effort succeeded in helping more children to go to school, it has largely failed to keep children in schools, which are under-resourced and overwhelmed. Students are in classrooms with 100 children or more and have few or no scholastic materials to support and engage them. Given the high rates of poverty, they come to school hungry, sick, and distressed, and have difficulty learning given that their basic needs are not met. i.HUG, in collaboration with our partners, run scalable, sustainable programs that address children, their families, schools and educators, and the broader community in a multi-pronged approach to ensure children can claim their right to education. Here are highlights from a few of our programs. Our education clubs fill a gap and provide to children needed education, enrichment, and support that they may not receive at school. The clubs also lessen the hardship on children during the weekends or the long holiday breaks in between school terms, when they often spend their days hungry and alone. A typical Saturday Club runs from 8:30 am – 1 pm. Children join together to receive lessons, tutoring and homework support, ensuring they can keep up with their studies and rigorous national tests, and enjoy an art-or science-based project. 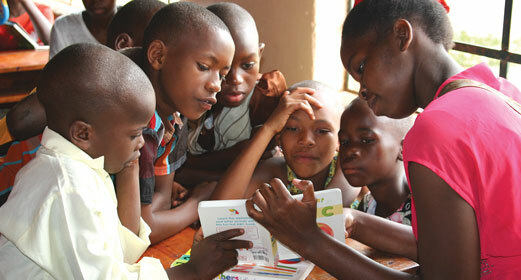 There are planned activities and sports, access to books for quiet reading, and food to help fight malnutrition. Older children in the program volunteer, improving the project and making it more sustainable. The space is a safe one for children, where they can speak with adults and receive advice and mentorship. Many children say it feels like a home away from home, empowering them with the tools and support they need to succeed in school. Young children learn a lot through playing, which is well evidenced to improve educational and social development. But in Uganda, sadly, children often don’t play – either because they don’t have time to due to paid and unpaid work, or because there’s little in the way of toys or safe spaces. The Ugandan Ministry of Education recognized the importance of play in 2007, to combat widespread drop-out and develop children’s social and cooperation skills, when they instituted “Free Play” as part of the educational curriculum. However, few schools have implemented this. The Learn to Play, Play to Learn program was developed to promote and encourage schools to adopt Free Play as part of their curriculum, and to support schools and teachers in learning how to best deliver and sustain the program. The most significant impact of the program is the joy it brings to children, enhancing their happiness and positive experience at school, which leads to a greater interest and engagement in school and learning. Critically, children that participate in regular play also develop improve key social behaviors that have significant long-term impact. This includes increased participation in school lessons, ability to develop better relationships with their peers and teachers, increased cooperation—taking turns and playing games together and having fewer instances of arguing and fighting–and willingness to share. As part of the program, parents and caregivers are also educated about the importance of play for children and work hand in hand with schools and children to make dolls, jump ropes, blocks, and other playthings that students can then use. Art and music can engage and inspire children, keeping them on track to academic success. However, with large class sizes and limited resources, many schools in Uganda can’t allocate time and resources to teaching art and music as separate subjects. Instead, we have launched a training program for teachers, which build their core skills and knowledge on how to integrate an arts education into the regular curriculum. Using a variety of techniques, these approaches can improve learning in large class sizes by making lessons more active, interesting and memorable. In 2016, we trained 12-15 teachers from three schools on an integrated curriculum approach and ensure their successful outcomes among the school’s most vulnerable students.